Last featured in August 2013 this is a model I still wear today. One of my favorite watches it’s frequently worn (in rotation with others of course) and never fails to make me smile with the knowledge that this was a good buy. Here I’ve taken a picture a few minutes ago at my computer, typing this Post. It still looks as good as the day I bought it, though I have a feeling this is no longer made as I don’t see it in Laco’s latest web site. In fact I didn’t see any top crown models at all, which is a shame as this was and is a delight to use. Especially with it’s neat dimensions of just 40 mm diameter and 9 mm depth and articulated lugs, means small wristed folk can wear this easily. 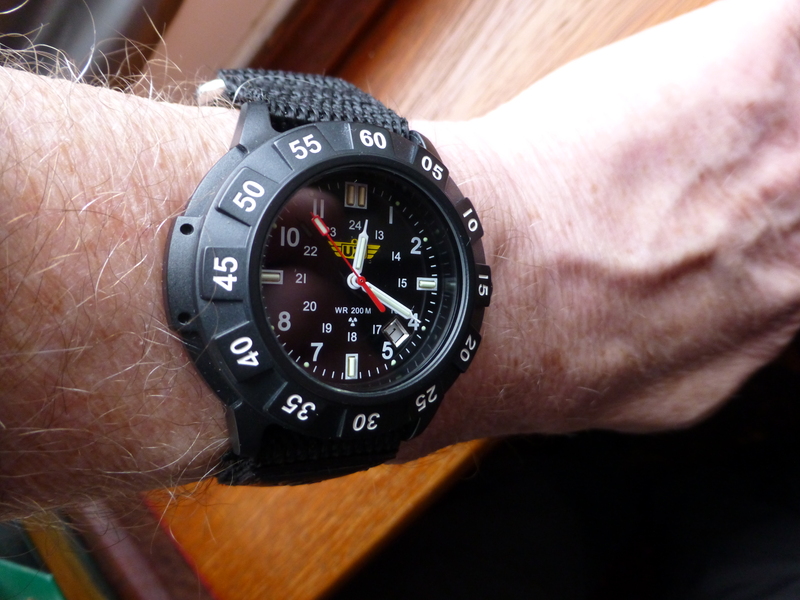 Gone for a bit of a monster this week, though in saying this, it actually fits even my smallish wrist not too badly. I always think just before I wear it, “Gawd” this is a heavy beast, yet I’m always relieved that once it’s on, it feels fine. In fact more than fine, it’s really rather good. Watch of the week – the impressive Pulsar Race . Yes it’s quite big looking and yes it quite heavy too – presence I call it! But it IS fun and I like wearing it with it’s new very soft rubber strap which allows a much better fit around the wrist than the “Michelin” original tire-like one, which was one of those straps that looked great on the watch but not on the wrist, unless you have very BIG wrists. Anyway impressive as always and invariably a talking point when people spot it. 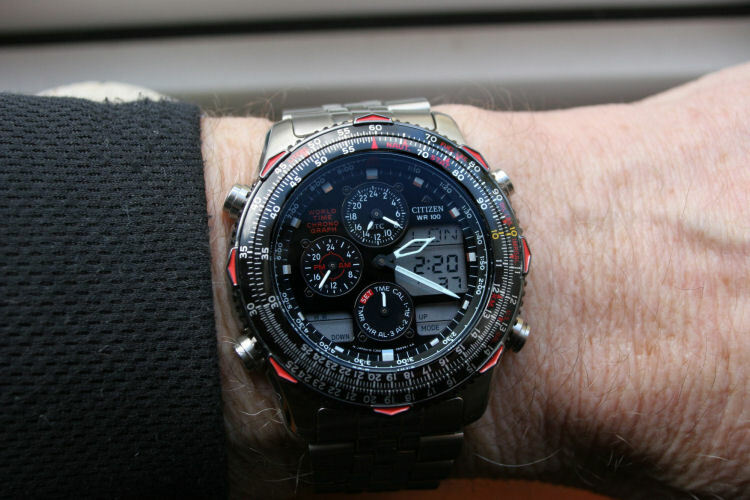 Practical too with it’s World Time and 100m Water Resistance, Stopwatch, Alarm and so on and it’s certainly different – and I like different as long as I can read it and at that it excels. Sunny day today – hoorah! 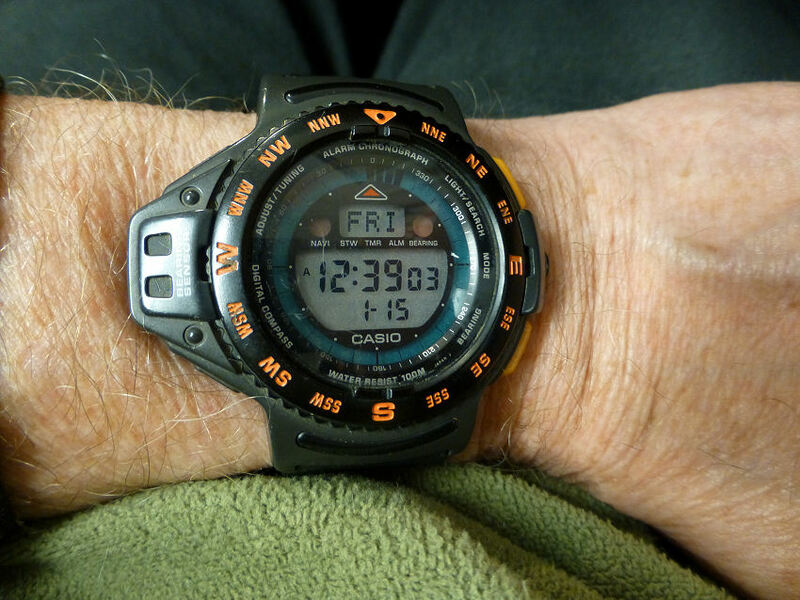 Maybe the same tomorrow, so off with the Tritium and on with the old compass Casio CPW200 and let’s see where to go today! Rare Casio CPW200 from the early 1990’s and still working great. Never ceases to amaze me this old watch – it just keeps going and that compass for taking bearings is more accurate than many of the more modern ones I can tell you. And it’s a neat size that doesn’t look silly on the wrist either. A classic if there ever was . . . . The days here are so dark that it’s almost odds on that I’ll be wearing a Tritium Light Sourced illuminated watch. The Traser Basic Classic Black – with Tritium light source for optimum vision. 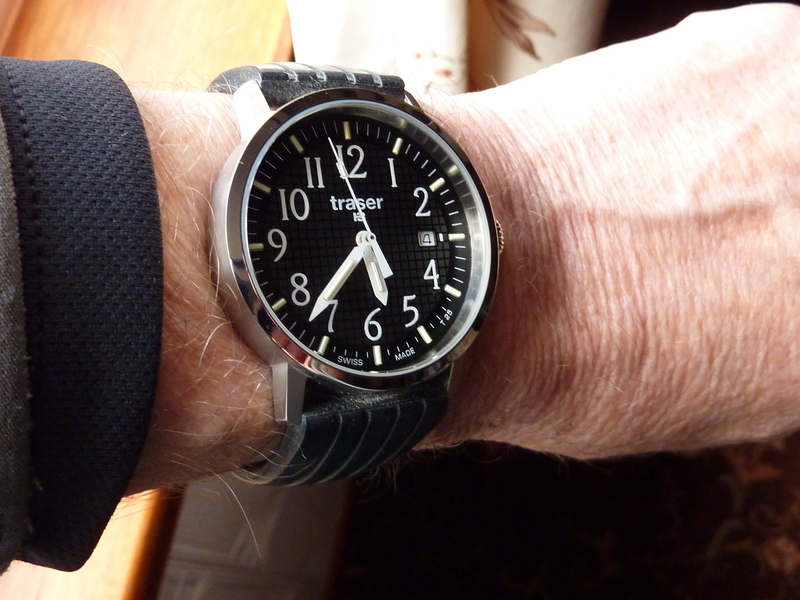 This is the basic Traser or as it is known – the Traser “Classic Basic Black” watch and almost a certainty for me to wear at this time of year. Perfect size for me at 40 mm diameter and one of the clearest faces you’ll ever see, day or night. The T4102.240.A2.01 was when I got it, a mid priced Tritium light source date watch, which features the mb-microtec illuminated dial features – 1-11 green tubes & the 12 with an orange tube, plus the hour, minute and second hands green tubed. This means that darkness is no problem at all for this model and so just perfect for these incredibly dull and dark days we are experiencing as always, here in Scotland. I feel this year is one of the worst yet for lack of daylight, so much so that I’m forced to take extra vitamin D to compensate. 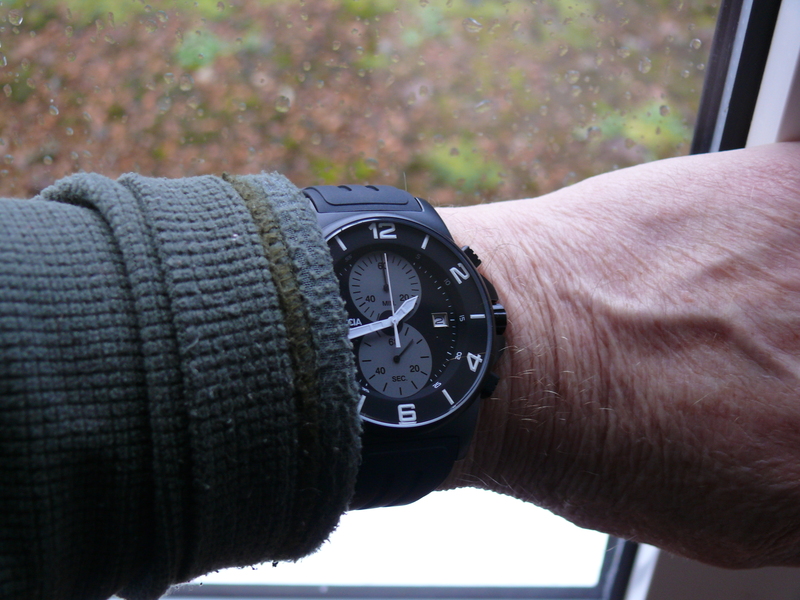 This watch is very comfortable on my replacement deployment silicon strap. It’s solid and dependable with its quartz Swiss Ronda movement and is one of those watches that you simply forget is there. But a quick glance in any poor light and you know the time. One of those neat dress like Casio’s that slipped under the radar and so well specified too. Composite case maybe but a great performer day and night! 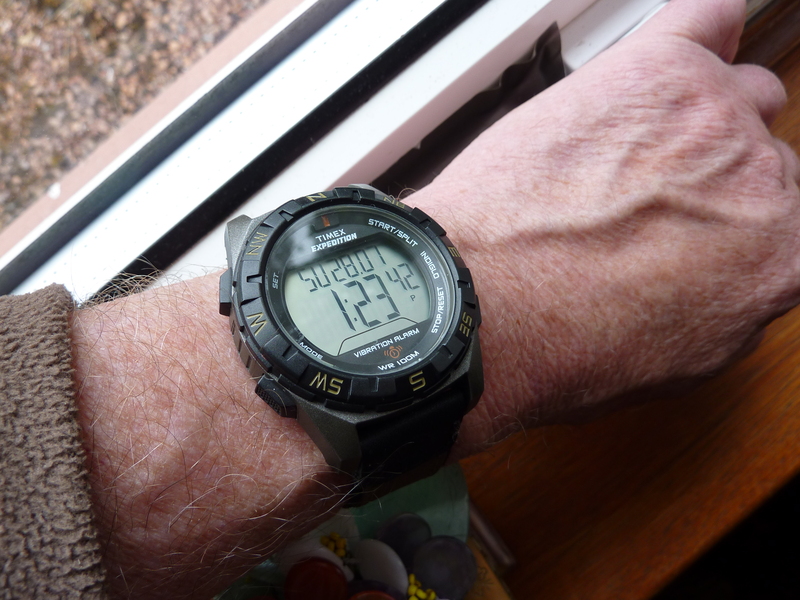 Casio Tough Solar WVA-470DE-1AVEF at under £100 – has to be a bargain! 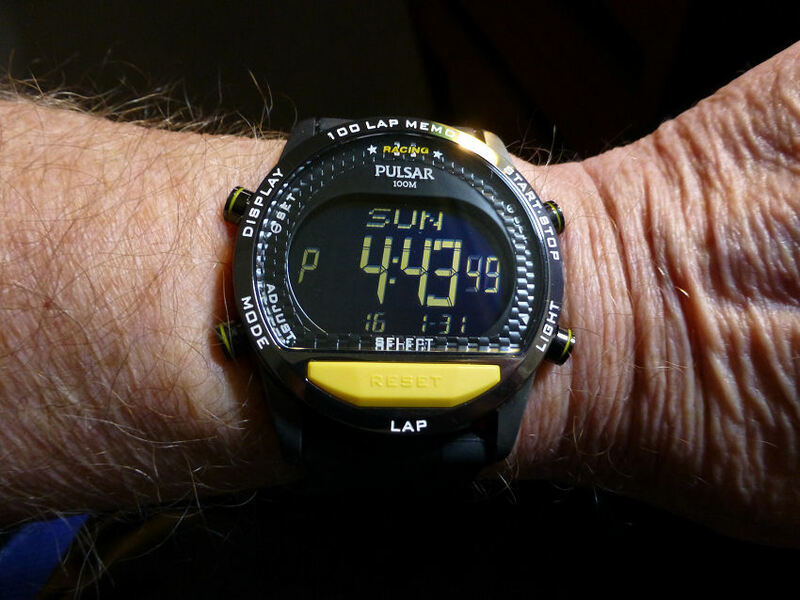 Module 5053 – data available from Casio if required. My elegant Bruno Söhnle Sonate 17-23109-241 in Stainless bi-color gold/silver ion-plated case with it’s unique fluted sides which is both remarkably elegant quite rare to find, especially in this price range and I personally find it very attractive. This model is powered by the excellent Swiss Quartz Ronda 1006 and is fitted to a Rosario Oiled Leather strap with a single fold-over deployment fitting. Xemex XE5000 with ETA 2836-2 Automatic with that amazing sweep seconds hand – a delight to wear anytime. 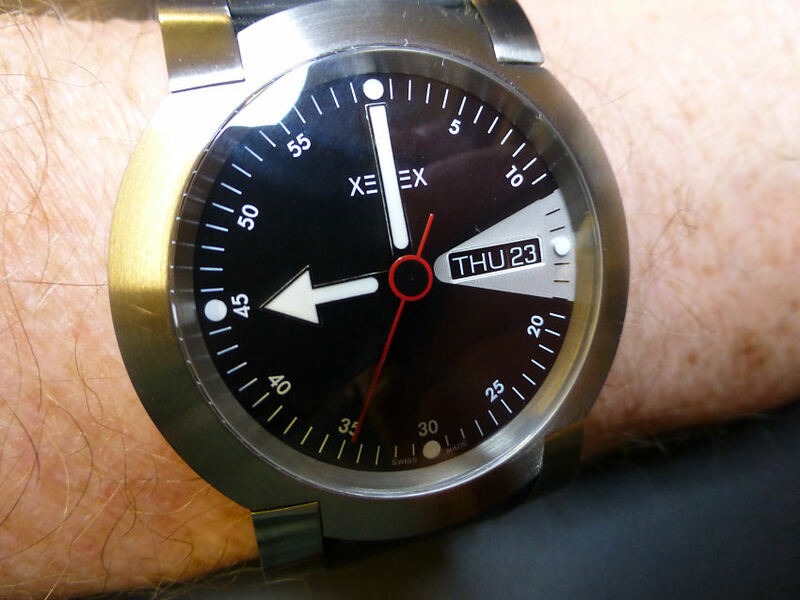 Love this as it’s THE watch for small wrists with the Xemex articulated strap case fitting, which hinges around the wrist, making for a very neat fit. 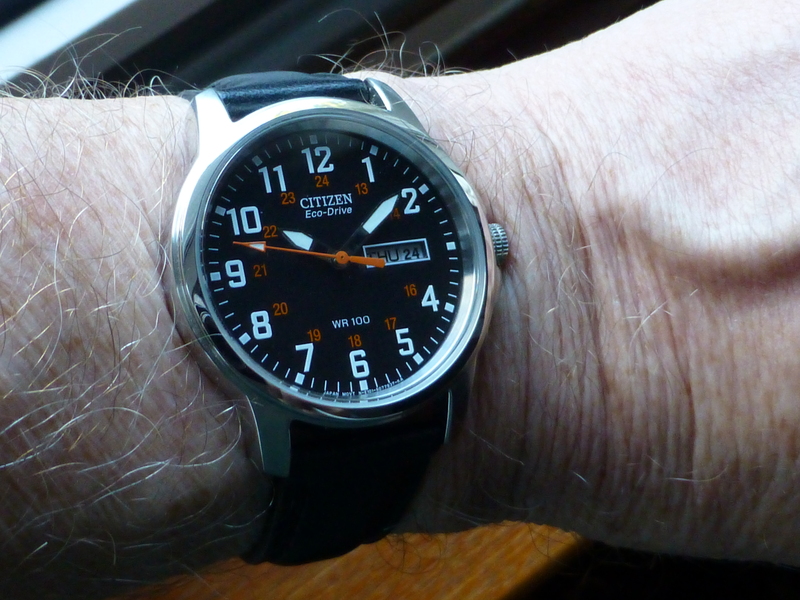 This Citizen JY0005-50E Skyhawk A-T Radio Controlled Eco-Drive reminds me so much of my old Navihawk of a few years ago, now updated for today with the addition Radio Control and Eco-Drive. Bit of a Classic I suppose and whist it’s not as neat dimensionally as the older model, it retains the look that attracted me in the first place. Cluttered dial it may be but it works and it is clear to read despite that – and that is NOT easy to achieve. Unlike my old model that I stupidly sold on, this one will be a keeper – and it’s not for sale – period. I always have time for this older Aeromatic 1912. 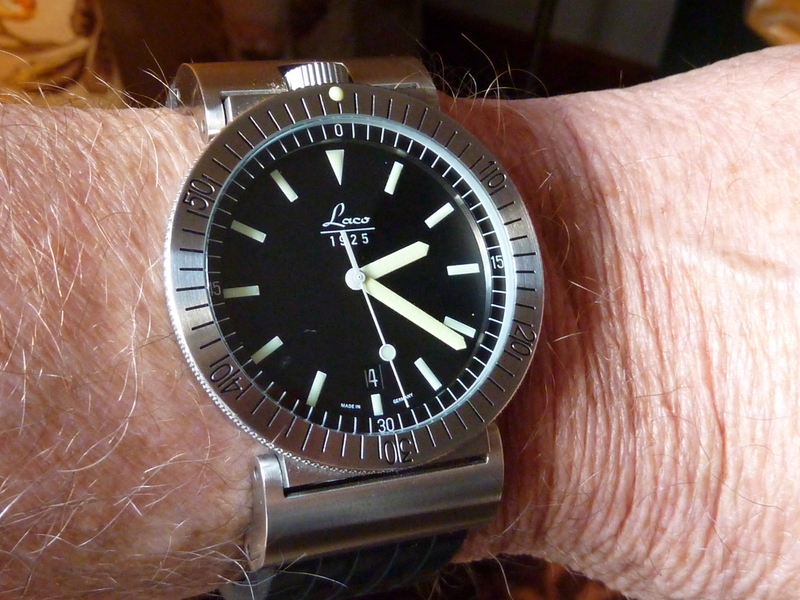 This particular model the A1027 has never missed a beat whenever I’ve worn it and that’s quite frequently too, just to remind me perhaps that a pretty cheap (at the time) Automatic such as this can be excellent value – and this is. Lovely smooth movement to adjust, which usually tells you something in itself. The movement is 22 jewels set in a stainless steel case with exhibition back set in a stainless screwed back. I particularly like the 6 curved recesses in that back plate which are beautifully cut so a back removing tool sits nicely in these to unscrew if you should ever wish to do so, which I don’t. The Water Resistance is a modest 5ATM and the overall finish is darned good with it’s smooth satin finish case and shiny crown top. The crystal is a nice domed mineral and looks just fine. A good leather strap and stainless buckle complete the outfit and I have no complaints at all . . .
Update (Feb 2015) – I’ve decided to move on some of the less expensive models and sold it a week or two ago – needed the cash for new acquisitions – it’s tough being a collector! There’s no question that Timex make really decent everyday models that are a delight to wear. At nearly 47mm across to the crown it’s a substantial watch, but wears remarkably small, as it is quite slim at a round 13.mm. And sporting it’s new silicon deployment strap it fits to the wrist very easily, so quite an improvement on the rather stiff original affair from Timex. I like the combination of analogue and digital here and being a perpetual calendar model, it says everything you want it to say, permanently. The luminous infils in the rather truncated Hour and Minute hands actually works well and there is of course an Indiglo back light for the digital display at night. 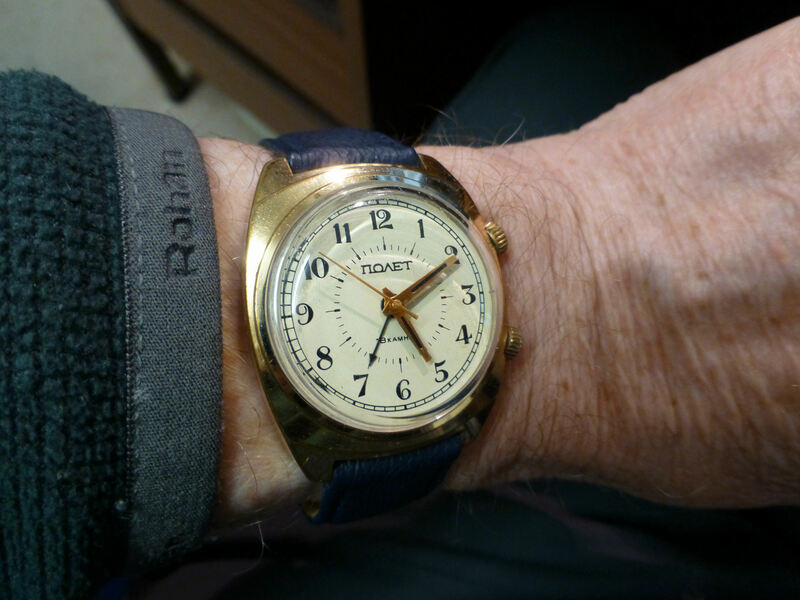 Another one of those Timex models that I find myself frequently wearing – surely a sign of a good watch and well done Timex again! The ubiquitous Timex and perhaps one of the lightest models I have, so much so you don’t really know you’re wearing it at all. 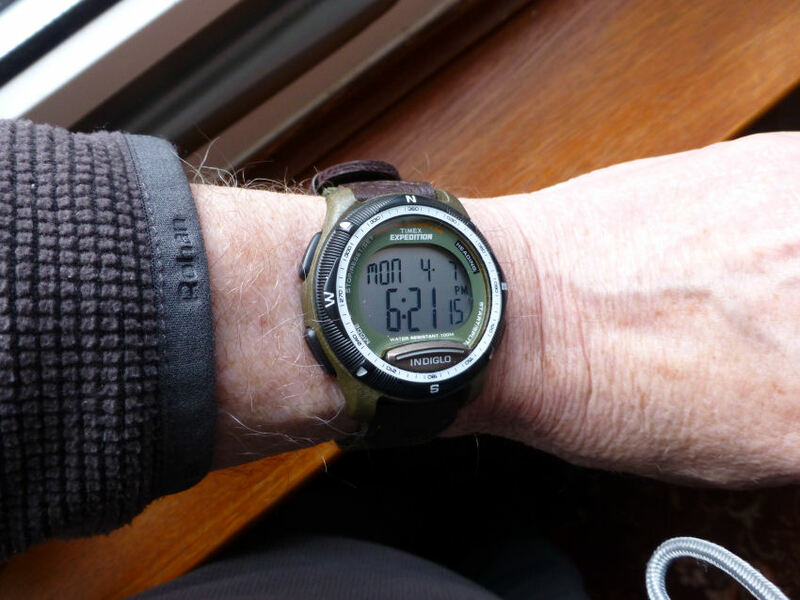 This is the Timex digital T41261 Expedition Compass watch and it does pretty much what it says and does it rather well, with no problems. 4 unobtrusive control buttons, Indiglo light source and 100m Water Resistance plus the usual digital functions set, Chronograph, Timer, Stopwatch, Alarms etc etc. It is also very easy to use and you can’t say that about quite a few digital models these days and it’s one of the main reasons I prefer in general Timex over Casio specifically in regards to their general low/mid range models – Timex wins every time for “ease of use” because their procedures are so intuitive as to be just about as good as it gets – in fact an example to all in my opinion. The Timex strap is a good one – a combination of leather and lined Nato, with standard buckle – it’s a winner all the way. 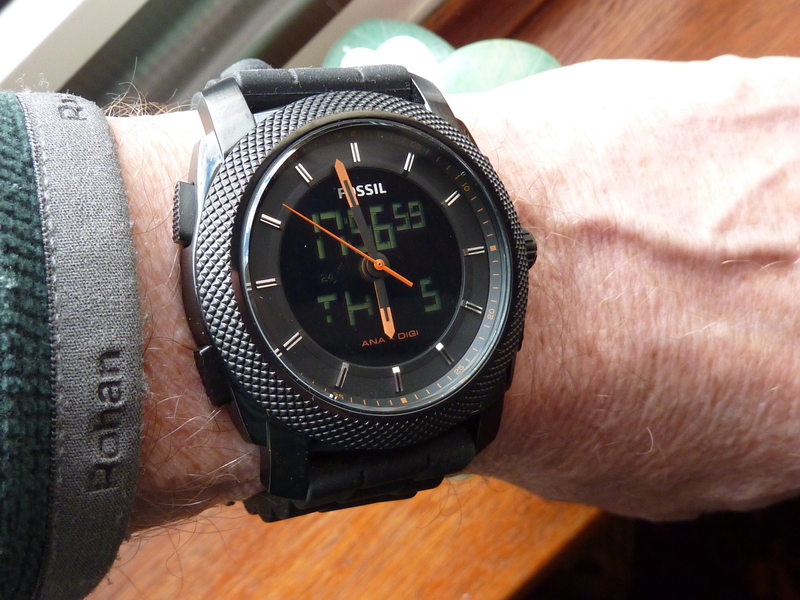 Heavy duty stuff this week, though in fairness this model looks larger than it is – as it wears very neatly on the wrist. The St Moritz Momentum Format 4 is fast becoming a real favorite here and probably getting more wrist time than fair to my other models, but hey I like it. St Moritz Momentum Format 4 – not much tougher than this guy! On first looks the dial has a very black background (called a blackout dial) within which there are two digital display windows. There are numerals at 12, 3, 6 and 9 with indices in between. An Hour and Minute hand plus a centre Seconds hand in orange plus a white coated end. The luminous aspect of each of these elements is provided by Super-Luminova coatings and according to Momentum, guarantees up to 8 hours legibility in low light and darkness. The heat tempered mineral glass is extremely scratch resistant and the analogue movement is Swiss quartz with LC digital display. The silicon strap that came with this model whilst OK, had the usual large rubber Diver’s “waves” near the watch, which didn’t allow the neat fitting I prefer against my wrist, so I changed it for an alternative silicon deployment style I like. The watch now sits much closer to my wrist and as it’s quite a thick watch, this makes it look much neater in my opinion. And of course as I’ve said before, one of the advantages of having standard lug pin strap fittings, which is so sensible. Made of high grade matte Titanium this watch certainly has presence, with it’s uni-directional wide deep figured bezel with luminous dot @0, plus a very definite 60 click function, large well figured screw down crown and shaped pushers. Surprisingly the dimensions are just 43mm x 14.2mm and the whole ensemble weighs only 90gms. What has surprised me is just how good this revamped model is. It really is well built and the titanium case is very well finished indeed. The digital aspect is also a revelation in that it is clear and easy to read in most lighting situations. All in all this Momentum Format 4 punches way above it’s weight and represents excellent value for money and I’m very pleased to own one and have the pleasure of wearing it. My classic Swiss Bucherer with it’s styled case with brushed stainless front facings and contrasting Gold fluted sides curving gracefully towards integral lugs. An original bright almost black colored cabochon tops the well defined crown @3 which completes the overall look. Bucherer Quartz with 6 jewel ESA ETA 978-001 High end movement. 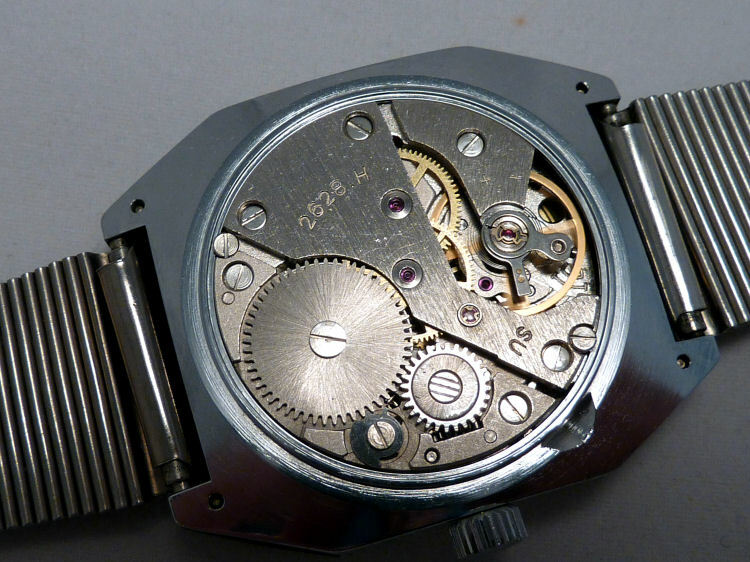 As noted in the image title the movement is a Swiss 6 jewel ESA ETA 978-001 with a Bucherer label – this was used quite often in the higher end quartz watches of the day. No longer available I think though there are possibly a couple of interchangeable versions from Ronda (751) and ETA (976-002) which might suit if this original movement had a problem. However this one is in excellent and completely original condition and complimented by an extremely soft and smooth fully lined original leather strap with matching gold buckle. Update – Sold this at auction recently (Feb 2015) and managed to get more than I paid for it originally – so that’s always good. The ubiquitous Skagen and there are lots of these around. This one however not seen so often and with it’s rather subtle color scheme and dial configuration, manages to shake off that “Danish” minimalist look, which I confess to finding a bit boring these days. 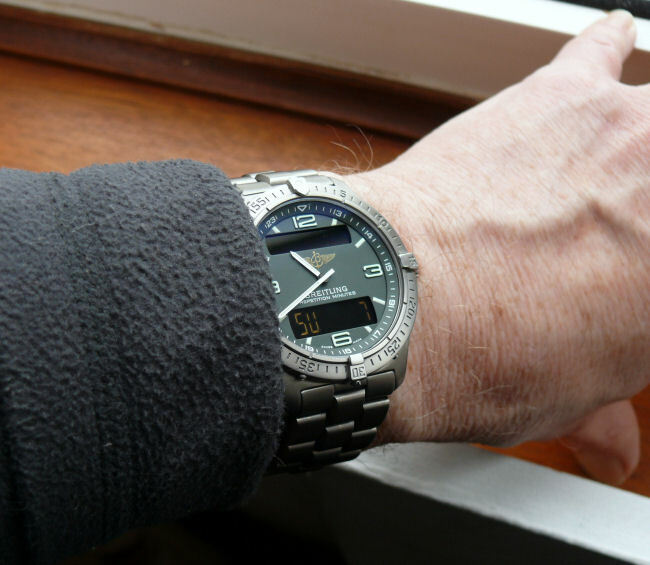 This is a refreshing change and I’ve had this for a couple of years maybe and it gets a fair bit of wrist time – so not so boring – this one! One of my favourite watches – my Junkers G38 Titanium Alarm model (6296M-5) – This is a superb looking chronograph with an excellent 4 jewel Swiss ETA G10.791 Quartz movement (exceptionally accurate) – features an alarm function, date window, very good luminescent hands and markers and a nice flat clear mineral crystal – all in a solid Titanium case, 42mm diameter and 11mm depth. Note the centre seconds hand is used in this mode as an alarm pointer, which is showing OFF as indicated on the outer marker. If I started the Chronograph, the seconds hand would immediately do a 1 sec jump to the 2 second marker and continue in standard chronograph function. There is already a sub-dial seconds which runs all the time. 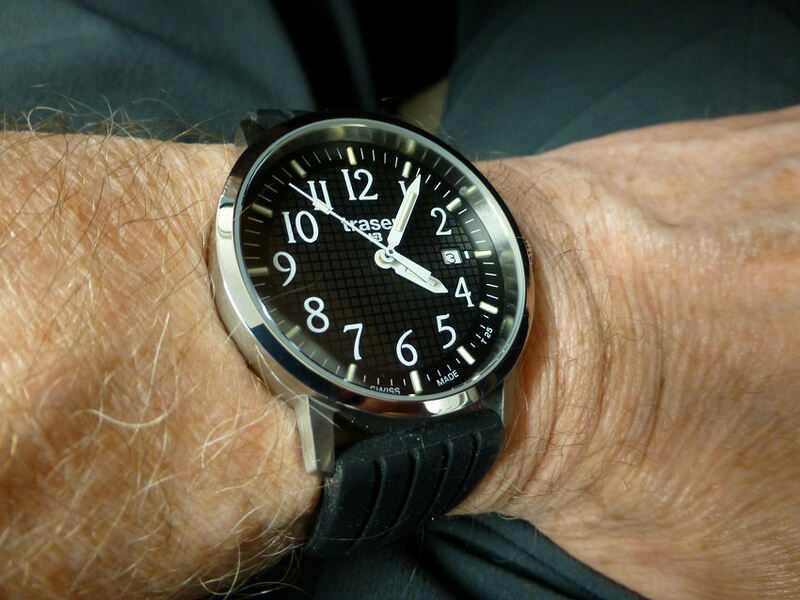 Junkers Titanium Alarm – one of the best. And speaking of luminous efficiency (noted in one of my recent Posts) this watch is a good few years old now and the luminous quality is still very, very good. In the minute it took to take the above image at the window in my house – and bearing in mind it is NOT a sunny day, the following photo further into the room (excuse the shaky hands) is the result. Pretty good result even against my super luminous Diver watches, as the markers are not large but long and slender, nor do they stick up and look thick. The hands are also slender, the lume being infills, yet hardly noticeable. However the wide spread of this dial gives great separation which makes reading at night very good. Now I wore this last night and prior to getting ready to retire, it was lying on the bedside table (there is a bedside lamp) and then worn during the night. It was still easily readable at 7am this morning (sunrise was somewhere around 7:40 ish I reckon) – so as a low light reader – excellent. 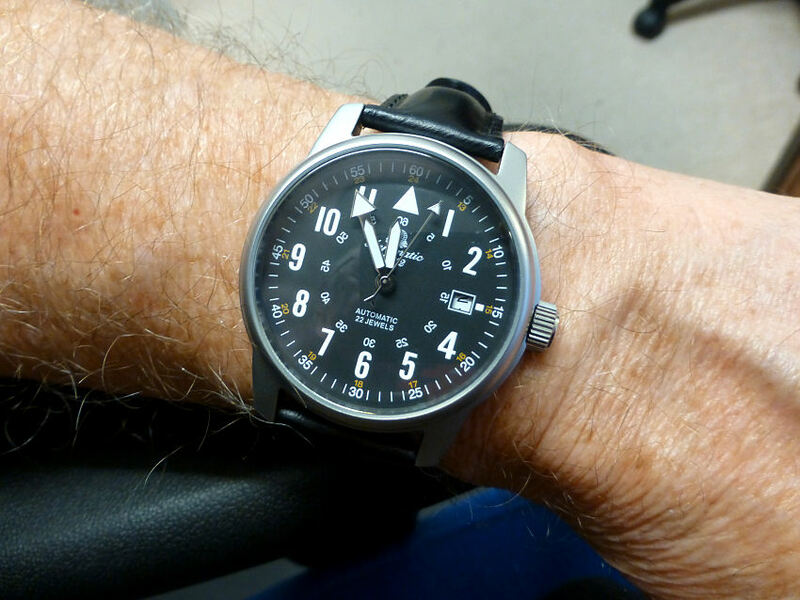 But as always this is a great watch to own and wear – and no doubt won’t be the last Junkers I own. One my older watches this week – This is the Uzi Tritium model which I’ve had for quite a few years now and it still impresses me as to it’s accuracy and it’s ability to still look as new as the day I bought it! 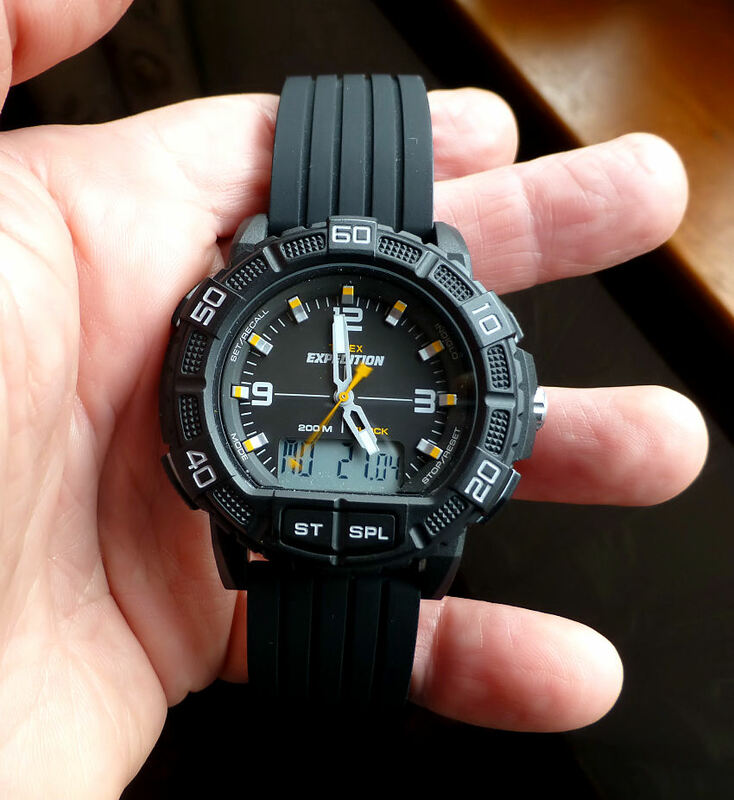 Hardened Mineral Crystal in a tough resin case, screw down crown with a Water Resistance of 200m (that’s 660ft), a black dial plus a one way rotating outer bezel, can’t be at all bad and especially for the price – I seem to recall somewhere around £70.00. It is a decent size too at 43mm diameter and 14mm depth, but it wears SMALL – it simply does not look big – probably as across the crystal face is only 28mm – but that doesn’t seem to detract from the fact that it’s really quite easy and clear to read despite the UZI yellow logo just below 12. Updated these days from this old model and from what I’ve seen still a very good deal for a neat practical all vision watch that won’t let you down. My vintage Sekonda 17 jewel mechanical hand wound gold plated is actually found quite often on my wrist, as it is a very nice watch to wear. A very clean and clear dial and one of the smoothest runners I have, with it’s Raketa 2609 USSR made movement. This model probably from around 1966-70 though the movement could be slightly earlier, as Sekonda didn’t appear as a badge until 1966 – most likely produced in the Petrodworzowy Factory in Russia. This movement and versions of it were used in Raketa, Sim, maybe Poljot and perhaps other Russian models of the period. It is a very stylish model from that period and it stands up well against many watches costing much more and it looks as good today as it did when first made. And that has got to be good! This Boccia Titanium Cal.05.11, model B3777-02 Chronograph, with it’s Citizen Miyota Cal. OS 11 Quartz movement is quite a stylish watch for the money. Boccia are the only brand to manufacture all their range from Titanium and a pretty big range they do today. 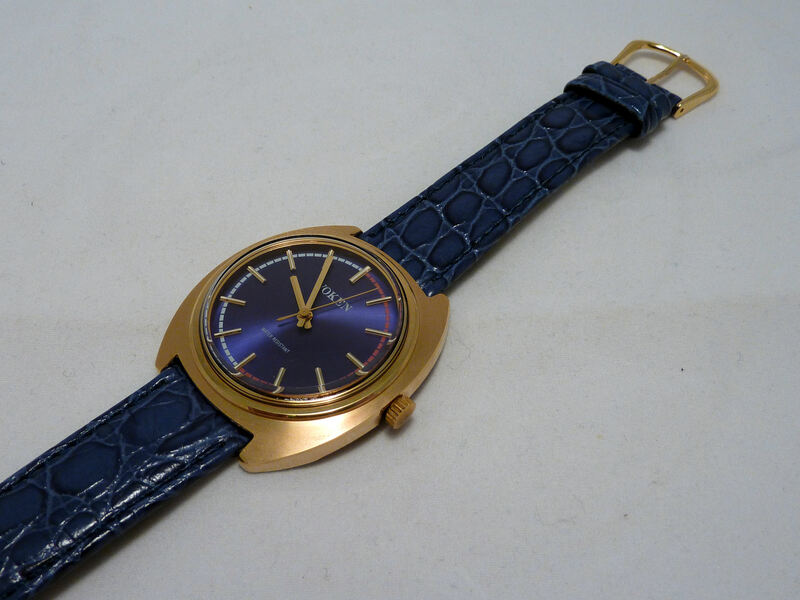 This model is a few years old (and still available ion their web site currently) and at that time many of their watches were quite dull color wise. Today they have upped their game with a super color range that are really very attractive. However that said the color tone belies a very good watch and this model has been excellent and still gets looks wherever I go – possibly as it has that flat but complicated look, but in reality is one of the most readable watches round. My gold plated Poljot “Signal” Alarm watch from Russia, 18 jewels 2812.1SU mechanical hand wound movement, made in around 1990 perhaps at 1st Moscow Watch factory (1MChz, Kirova, Poljot). 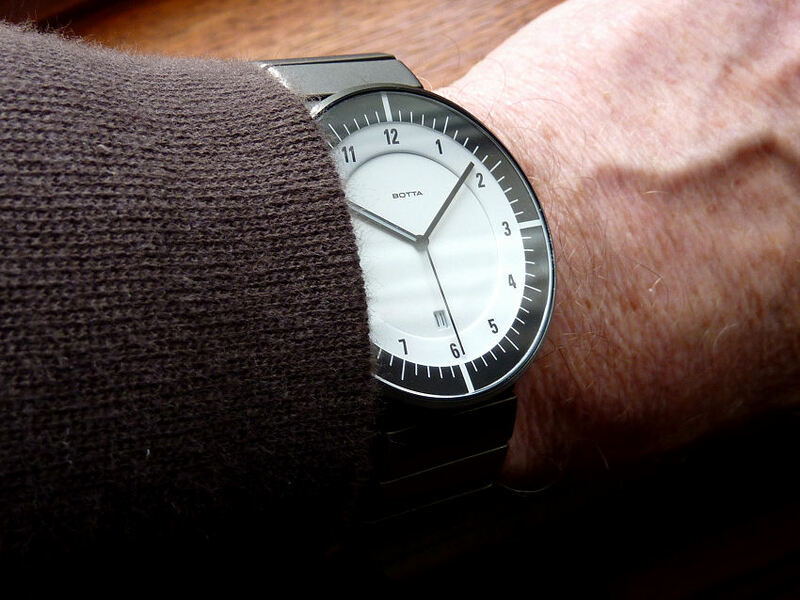 Poljot “Signal” Alarm watch – simple and effective. I tend to wear this on the odd holiday as it has one of the best and loudest alarms of my collection. It also vibrates somewhat like a mobile phone. Nice size too at 37mm diameter and so simple to use. Set the time and wind using the lower crown. Set the alarm (anticlockwise) and wind the alarm with the upper crown – could not be simpler. 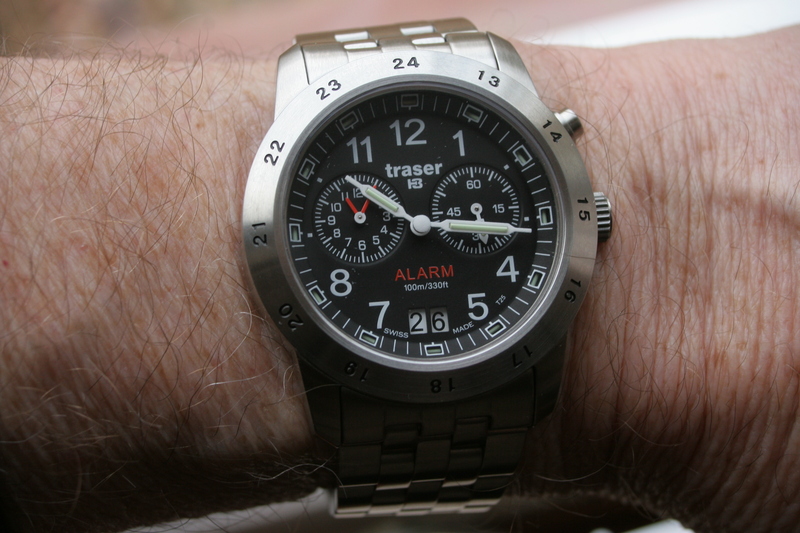 I prefer it to any of the electronic alarms watches I have as I find them difficult to hear – not so this model, no sir! The alarm sounds for around 15 seconds and that’s it. 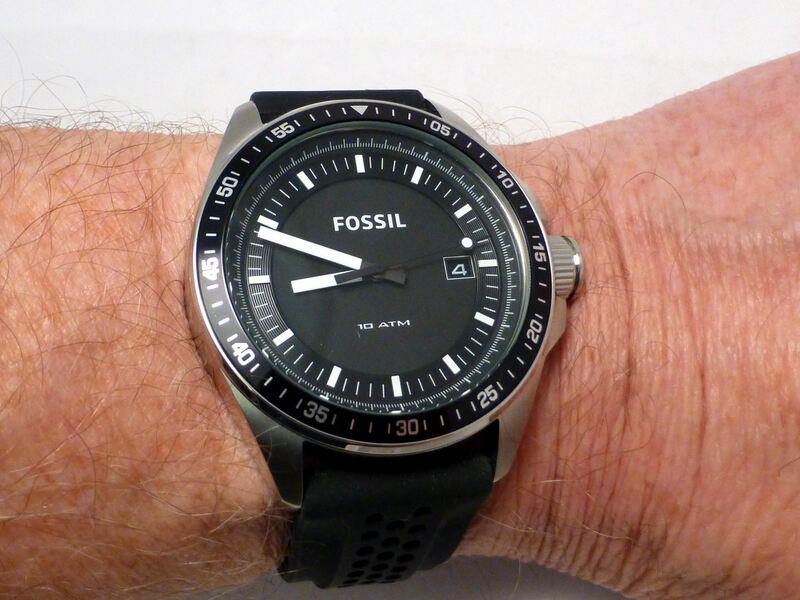 From the “Decker” range, the Fossil AM4384 Black silicon Strap Date watch is a model that I always like to wear. Fossil “decker” – solid dependable and comfortable – OK? It’s a big watch for me at 43mm diameter (ex crown), 13mm depth, weighs 92gms with strap, but interestingly it’s one of those models that actually looks “neat” on the wrist. 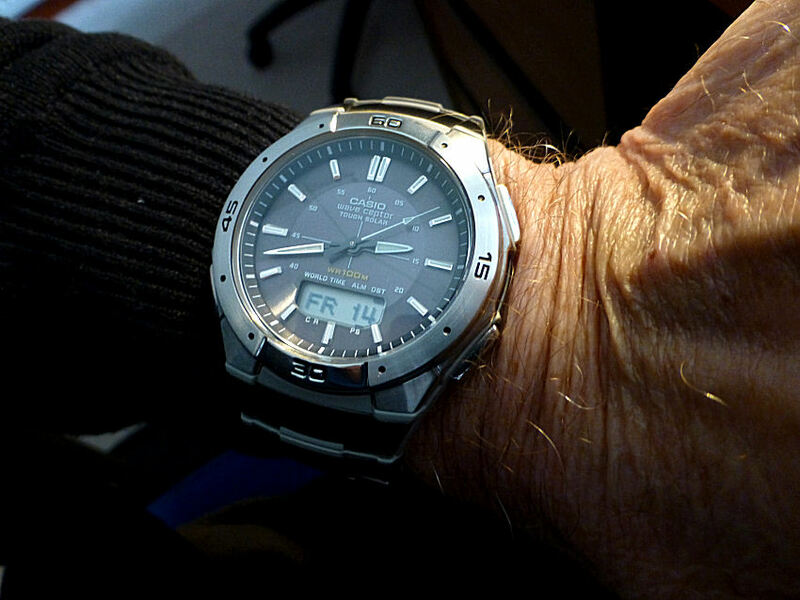 In fact it looks slightly bigger than the Seiko Monster Diver when wearing it, but not so in your face and I like it. One of the nice points is the flat crystal which is not specified as anti-reflective, but it IS remarkably clear and scores VERY highly in the clarity stakes. Always a good buying point for me. It also scores well in the Water Resistance stakes with a good 100m depth figure, so swimming is no problem. And finally the “dot” second hand somehow ticking along gives a wonderful solid and dependable feeling – silly I know, but that’s what it does for me and the luminous quality of this particular one is outstanding. So a great watch to wear and yet seems so much more than it’s constituent parts – it just works. Oh I forgot to say – it’s a quartz movement and as accurate as any quartz model I have. Can’t say more. A classic traveling model this week – my Longines GMT Lindberg World Time Automatic with it’s silent ,smooth sweep 33 jewel Longines L635.3 Automatic movement. One of the clearest watches to read, thanks to both the dial and crystal design. The former being so cleverly configured and the latter with a subtle curve so well angled that anti-reflect coatings are simply not required. This model a real favorite of mine, especially when traveling, as it manages a World Time feature without drama for around 24 time zones. To set to another place simply pull out the crown one click which independently adjusts the hour hand (the minute hand is unaffected) to the position opposite your destination/time on the main Time Zone bezel. What I consider a proper “quick set” as it is uniquely bidirectional and really quick. The corresponding time is shown on the revolving outer disk aligned with the zone and is synchronized with your local time @12. The other point with this model is it’s extreme accuracy when checked against one of my Radio Controlled models – it is difficult to see any variation at all even over 21 days, which was the length of my last holiday. Checked before I started and checked again on my return – wow! This military inspired Citizen Eco-Drive 180 ( BM8180-54E ) – with center seconds highlighted in red with pointer and a nice sized day and date window @3. All in all, this is a classic Citizen and made at a a time when they really made watches for practical wear. A rare breed these days, it really says everything that one would reasonably need in an everyday watch, which basically is – The Time, Day and Date, plus a great clear seconds hand and Water Resistance to a very commendable 100m. Black dial with broad white luminous infill hour and minute hands in combination with clear numerals, makes for a really easy read face. It can be bought with a stainless bracelet, but for me I found it a little too sharp edged for my wrist, so my preference is for a good leather strap. Great Citizen guarantee of 5 years with the Solar Powered (Eco-Drive) quartz movement, it never needs a battery and being a compact 38mm diameter (excluding crown) and 10mm depth, it’s neat and very unobtrusive to wear. 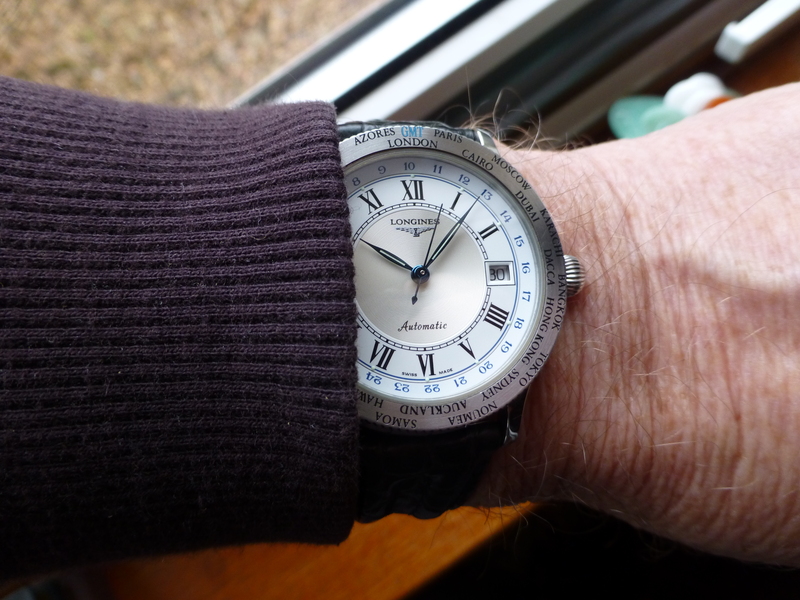 An ideal daily beater and value for money and when I bought it some years ago at under £100 – what more can you say! One of my favorites I admit – perhaps as it’s a bit of Ana-Digi Retro style that makes me smile, but it is a super little watch to wear. I’ve said it before, but it really does draw comment wherever I am if someone spots it. Digital display, Chronograph ( up to 24 hours), 1/100 sec, Alarm, Dual-time zone, Thermometer, Auto-calendar (to year 2099), LED back light, Battery life: 2 – 2.5 years, Water resistant, Dimensions: 42 x 34 x 8 mm and the weight is 72g, so a nice light wear on the wrist. It certainly does go to show that you can’t beat a great design and this in my opinion – is a classic. A basic Traser or as it is known – The Traser “Classic Basic Black” watch and this time is flavor of the week and with it’s replaced strap/bracelet, one of the most comfortable watches. Nice size for me at 40mm diameter and one of the clearest faces you’ll ever see, day or night. 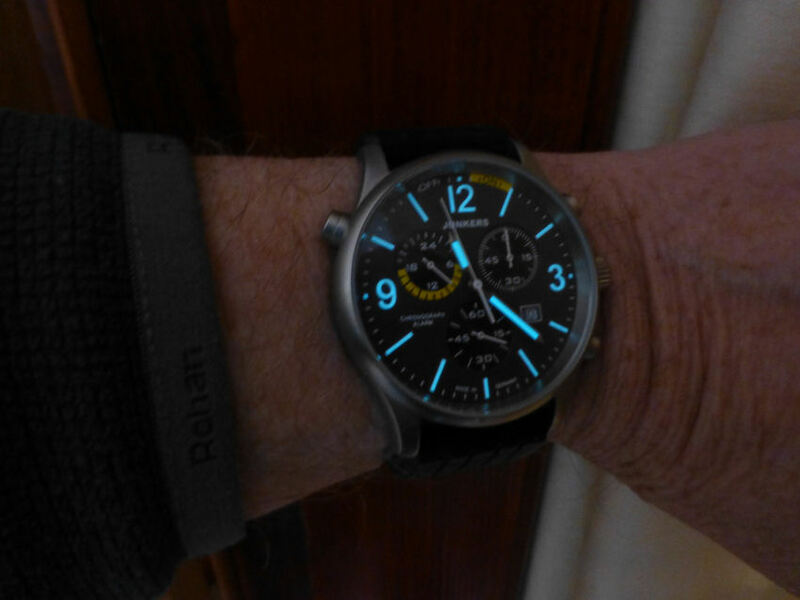 The model T4102.240.A2.01 is a mid priced Tritium light source date watch, which I confess not being over keen on when I first purchased it a while ago. But since then I’ve found that I wear it quite often, which is always a good sign. The mb-microtec Illuminated dial features – 1-11 green tubes & 12 – orange tube, plus the h/m/s hands green tubed means that darkness is no problem at all for this model as it is bright enough (almost) to read a book by. So a very practical Ronda powered date watch and a nice “beater” to own. A bit if macho power – the Black Fossil Machine Chronograph Alarm FS4682 with black Ion Plated solid Stainless Steel case with a wide matte black heavily knurled bezel and a flat non-reflective crystal. A rather rare watch these days, which is a pity as this was a great model from Fossil – one of, if not the only, ana/digi version they made and it’s in perfect condition. A powerful performer and complimented by the inclusion of not one, not two, but three batteries for it’s lifelong guaranteed Quartz movement. What I like is the fact that many digi models produced by non digi folks are poor, but this is a rarity – the matrix digital display is excellent and bright enough to see in most conditions. This is one however that has to go to make way for newer buys, which is a shame I suppose, but somebody is going to be very lucky as it’ll probably sell on for around £50 – a bargain in any language! I’ll be sad to see it go . . . .
A favorite articulated lug Laco 1925 model. Otherwise known as the Laco “Squad” watch, this is the smaller quartz version at 40mm diameter just 9mm depth, makes for a neat watch. The heavy “articulated” lugs and protects the large crown very well which at the 12 o’clock position. It features the Swiss Quartz ETA F06.111, a well made case in solid brushed stainless steel with a unidirectional bezel. AR coated crystal makes the dial clarity something special as the mat black is in high contrast to the highly luminous hour markers and Superluminova C3 hands. I’ve found this model to be great as a “wearing” watch and one of the best in low light as the hands are so very clear. So, one of my “daily beaters” I suppose you can say and one that is a very good example of articulation – it is VERY comfortable indeed. The light weight but tough Timex Expedition (vibration alarm) favorite. Always a solid performer when doing these physical tasks, or those that are on this amazing list the Wife gives you, over a weekend. Great time keeper obviously being quartz and amazingly clear to read in any light, good contrast and lots of information up front. A good strap too, which is such a treat these days and this one is pretty much OK from Timex I have to say. Timex Expedition Vibration Alarm model. I also like the color combination of black and green of this model, which is one of those watches that looks “just right” if in Khaki or “Safari” mode and certainly over the last couple of weeks with this unprecedented sunny and hot spell, it’s also a model that for some reason never “sweats” the wrist under the strap in very hot weather. Definitely a holiday watch, but not a throwaway, no sir – this is a model I’ll have for a very long time! One of my favorite watches – known as the World Perpetual A-T – or the Citizen Eco-Drive A-T CB0020-09Ea superbly made 42mm diameter, 11mm depth stainless steel Radio Controlled model. 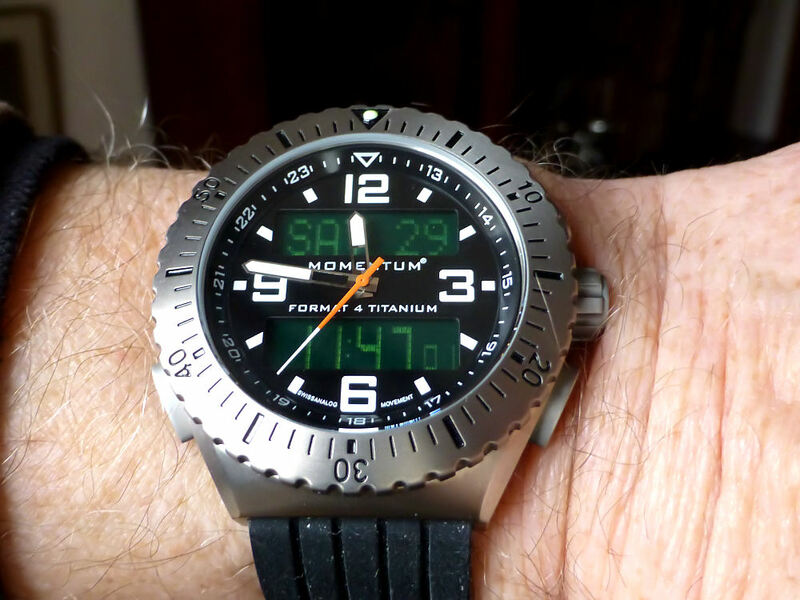 The movement is the H144 caliber and with radio receivers built in and Radio Controlled, so assuming you can receive a signal from one of the 5 transmitting stations, then it’s pretty much the perfect time keeper – it’s stand-alone accuracy without RC is pretty much standard fare for this range of Citizens Quartz at around +/-15secs per month. Had it a few years now and it has always been perfect, gets the signal every time and an accuracy that’s nigh on as good as it gets. Very easy model to live with. Going to France perhaps with a +1 hour difference – simply pull out the crown to the first position, the second hand points to the time zone you are in (here in UK it’s indicating London) turn to +1 on the dial, the second hand moves to +1, re-set the crown and the Hour hand moves forward 1 hour – and you’re done. You are now on French time – could not be easier. No doubt about it, one of the best models I’ve ever bought. Perfect time, no battery changes, great Water Resistance – simply wear and forget! A neat Raymond Weil dress watch with fancy case/lugs. 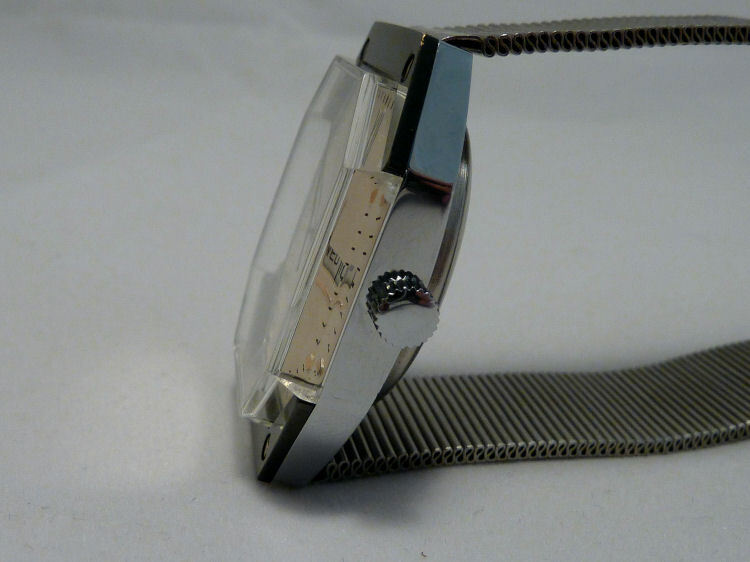 This is an older model, perhaps from the 1990’s and ideal as a very smart dress watch at only 6mm thickness. Date @6, black steel hands plus seconds center hand in a 9k gold case. If I remember I got this from an auction of Jewelers NOS at a seriously good price. Not one of Weil’s most expensive models of course this being a quartz movement, but a classy little item nevertheless and I find I wear it on quite a number of occasions. The oddly named Voken it is this week. A little watch I got some years ago for the price of a packet of cigarettes. It keeps time with the best of them and has never let me down. Blue strap suits this Voken perfectly! 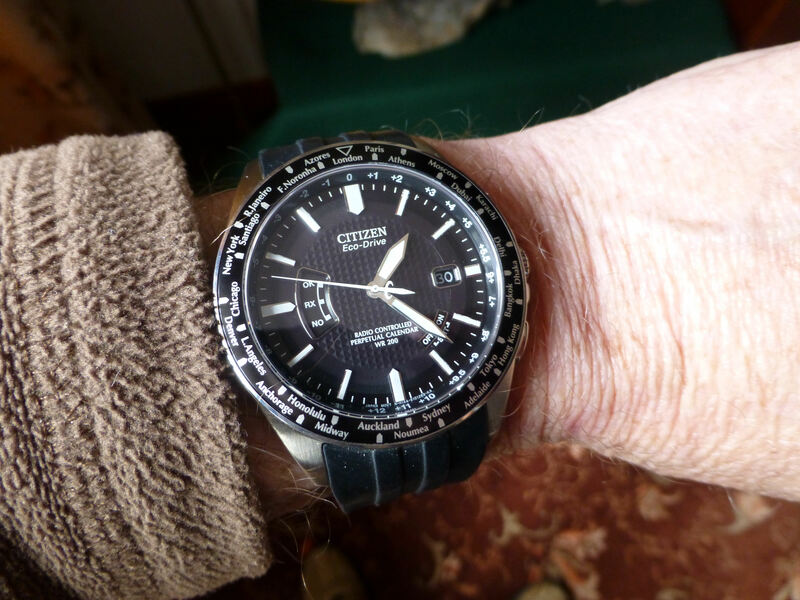 This one is from Japan and made basically for the Asian market (an offshoot of Citizen I understand) and it’s actually a nice watch to wear, especially with my replacement strap, which sets off the watch dial colour to perfection. I wore it recently when out to dinner and was actually complimented on it – so that can’t be bad – can it? This time it’s an old favorite – The Citizen Navitimer. One of those watches that looks big but isn’t! Fits a small wrist without a hitch and looks as good today as when I bought it. 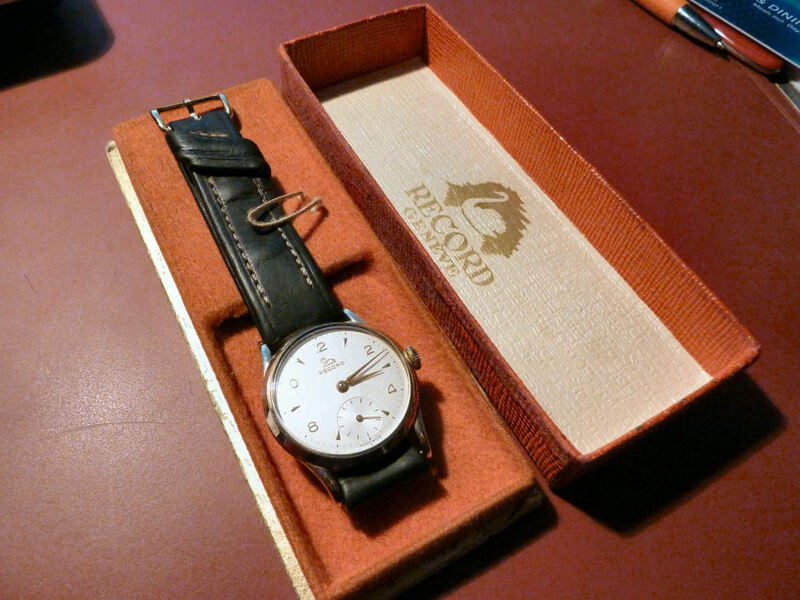 I don’t think they’ve managed to make it any better even now – it was just the most comfortable watch to wear and own. 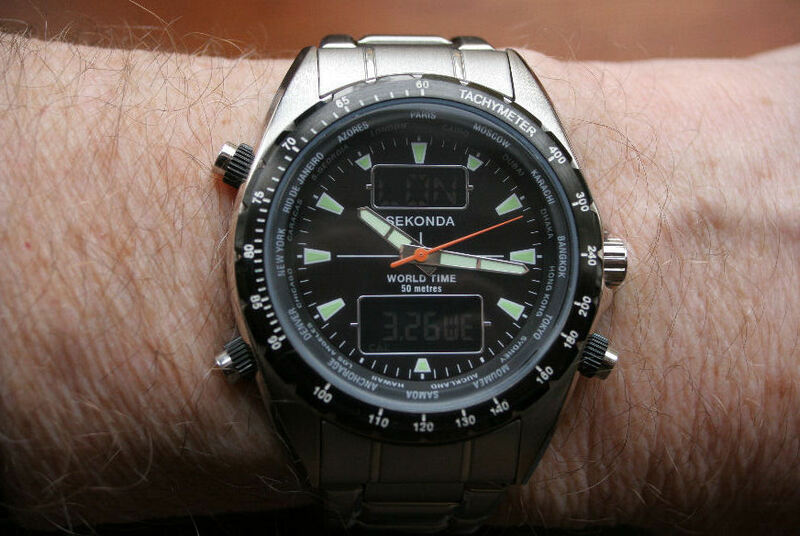 In amongst my older watches I spotted this old favorite – the Sekonda World Timer. Quite an amazing purchase in it’s day as it was well specified and low priced. It could so easily have been the match for the Citizens of the time were it not for the digital display – let down by the fact it was really was quite difficult to see and simply not bright enough. But otherwise an excellent watch, solid, quite well made and as accurate as most. I still have a soft spot for this one. 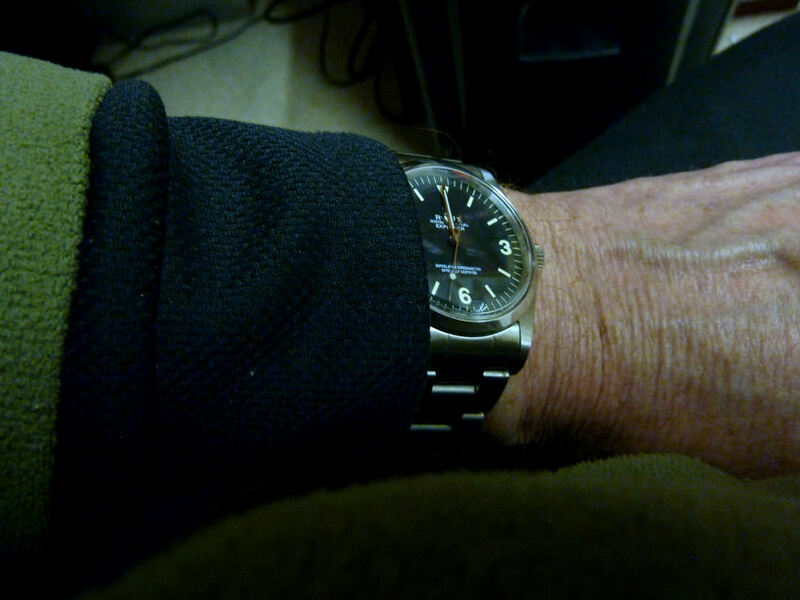 Wearing my favorite Traser – the Classic Big Date Alarm with Microtec H3 Illumination. Lovely heavy stainless steel bracelet version and without doubt in my opinion the best quality Traser of their entire range. Unlike the latest “Basic” model with that ghastly “elastic” expanding bracelet, this is very high quality, solid link and smooth as silk. An absolute delight to wear. Whilst it is a heavy and beautifully constructed model it is only 40mm diameter and suits a small/medium wrist. Highly visible at night of course with the gas capsule hour markers, hour and minute hands and small seconds hand too. Large double date window @6 and a sub dial @9 which you can use as the alarm setting. An absolute Classic as far as I am concerned and one that will stay with me regardless of tempting new buys. Well it looks as if I’ve gone native! By that I’m wearing all week this lovely old Smiths Astral from the 1950’s. 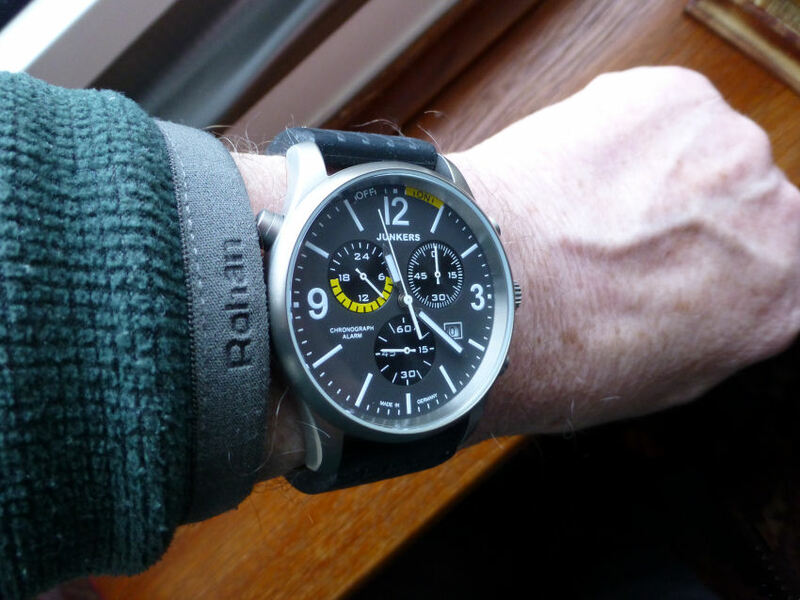 At 34mm diameter – a nice size for the wrist. They don’t come more classic than this. A center seconds blue steel with red arrow tip and blue steel hour and minute hands in a perfect original dial makes me smile every time I wear it. A lovely 17 jewel English hand wind manual shock proofed lever Movement and manufactured in Cheltenham, England. A joy to wear and almost as old as I am! Now that’s classic! 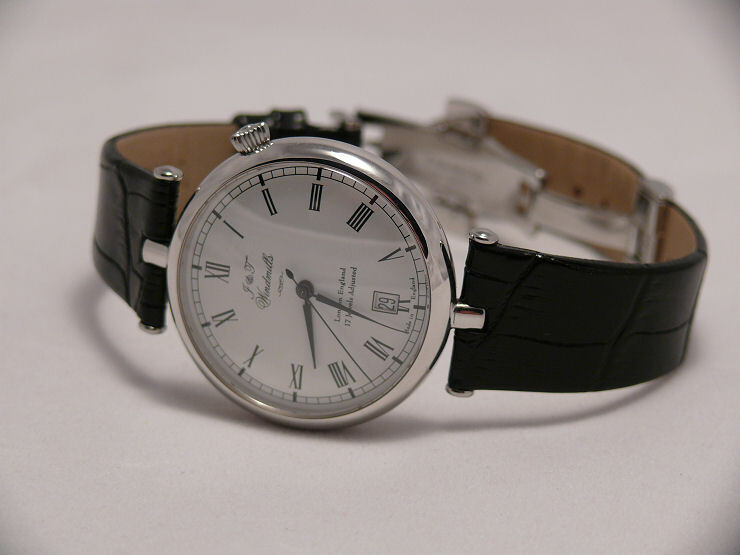 A favorite maker for me is Bruno Soehnle and this one is another neat model – the Glashutte Ares Gents dress watch. With a stainless steel case diameter of 41mm and only 6.2mm depth, this is a very sleek watch. Fitted to a dark brown leather strap with light stitching and lug width of 22mm makes it look very well balanced on the wrist. This one has a silver dial with black Arabic numerals, rose gold hour markers, rose gold luminous hands and a Bruno modified Swiss Quartz Ronda 1009 movement. Small seconds sub dial @6 and a date display @3 all under a sapphire crystal with anti-reflective coating applied. Crown and stainless steel back are both Bruno logo engraved. Weight approximately 42g and Water Resistant to 30m. 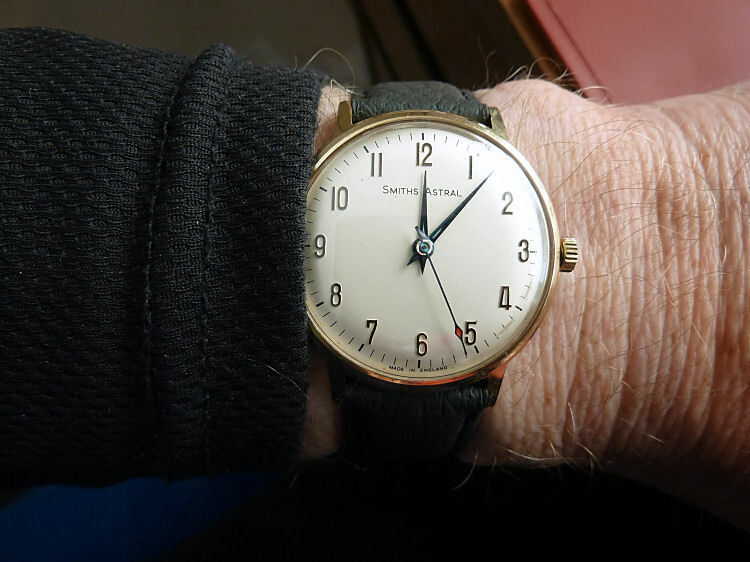 A very elegant and refined dress watch which is just that little bit different and is my second Bruno Soehnle watch, and definitely not the last. A 1940′ vintage Girard Perregaux in 14ct solid Gold. 17 jewel manual wind signed movement and in perfect working condition – great for dress wear. Girard Perregaux – c1940 – style indeed. Smallish by today’s standards it can suit ladies or gentlemen and comes with quite a bit of style and very easy to read – unusual numerals too which is just that bit different. The Botta Argos Titanium Quartz with Ti bracelet – one of my favorite watches to wear at any time. Very clear and legible and so light and flat it’s virtually part of you. Check out this weeks post – features a quick look at other Botta watches, namely the Uno 24 and the Solus – very special models and something that little bit different. A classic Rolex Explorer 1016 Auto Cal. 1520 – I’ve always preferred Rolex models without any outer bezel. 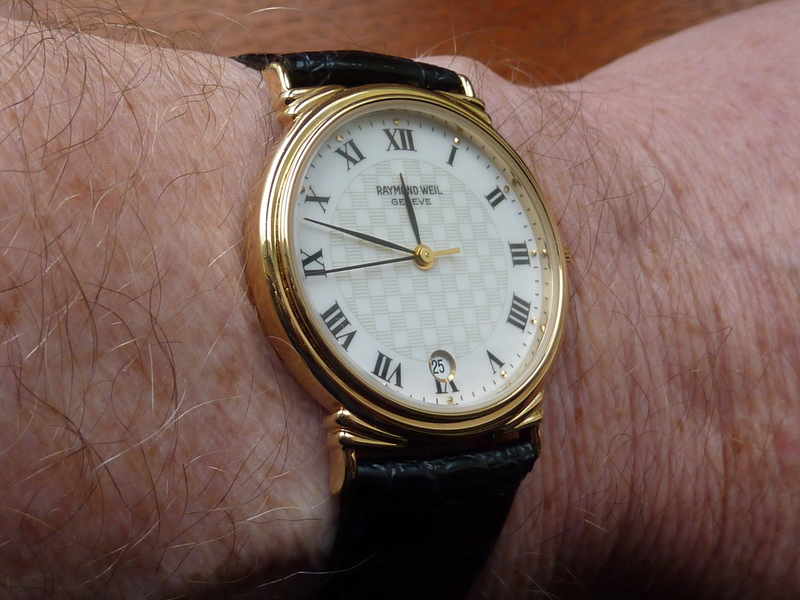 There was always something about the case of this watch – so smooth and comfortable to wear and being quite a small diameter by today’s standards at around 34mm without the crown, it looks very neat indeed. The crown incidentally is also slightly larger, with well defined quality knurling than many watches, so is easy to adjust. An old favorite – a 1946 9ct gold manual wind Record. 12½ Ligne/Calibre 022-18 15 jewel movement Swiss classic dress watch. Record Swiss manual Gents – with original box. I’ve listed this one as wrist watch of the week here instead of Vintage, purely as to the fact that I AM wearing it this week. An absolute classic Swiss watch of it’s time I particularly like it as I have the original box and the original strap. When you consider it’s age at over 60 years, the fact that it’s time keeping is nothing short of excellent and the even better fact that it cost me the princely sum of £28 – it’s got to be top value. 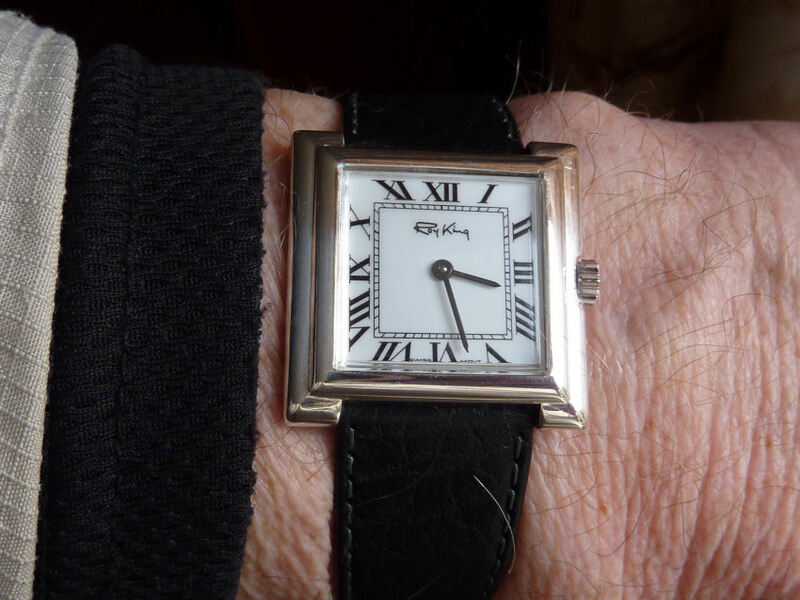 A solid silver cased Roy King 1997 iconic British brand with a Swiss made mechanical hand wound movement from possibly Beuche Girod. Always gets comments whenever I wear it. A Citizen stainless steel case date watch with gold color bezel and matching crown – Quartz day/date Cal.2500 movement and with 10bar water resistance is a pretty solid performer. Luminous hour and minute hands and a gold sweep center seconds with the date and day widow @3. Applied gold stick and numbers markers with luminous dot markers make for a good dial set up. 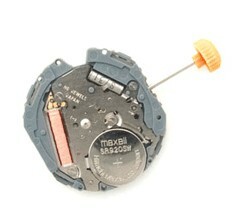 the battery corroded and the movement locked up solid. 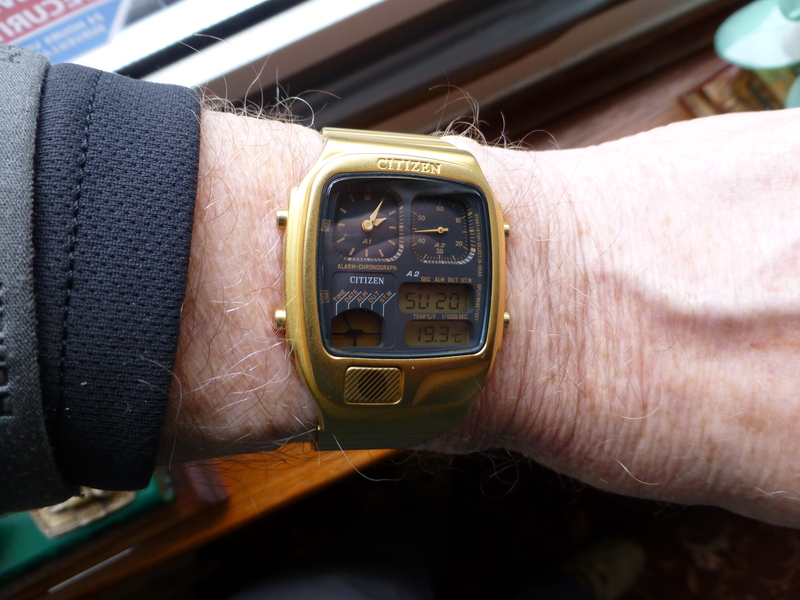 Well happy days as in this case the good Cal 2500 can be replaced with a Miyota quartz watch movement and as they are made a division of Citizen LTD – this is a direct replacement. This enormous range of Japanese made movements can fit many Citizen, Bulova, Miyota, and Wittnauer watches. I picked this watch up some time ago and stuck a new battery in it, replaced the terrible old scratched bracelet (I prefer straps anyway) with this neat Birkenstock Leather I found in another drawer, albeit in green – fitted it and it actually looks OK.
As said – a good, solid, everyday watch, which is something Citizen are very good at producing, quite apart from their ana/digi and chrono brigade styles – this one says it all. 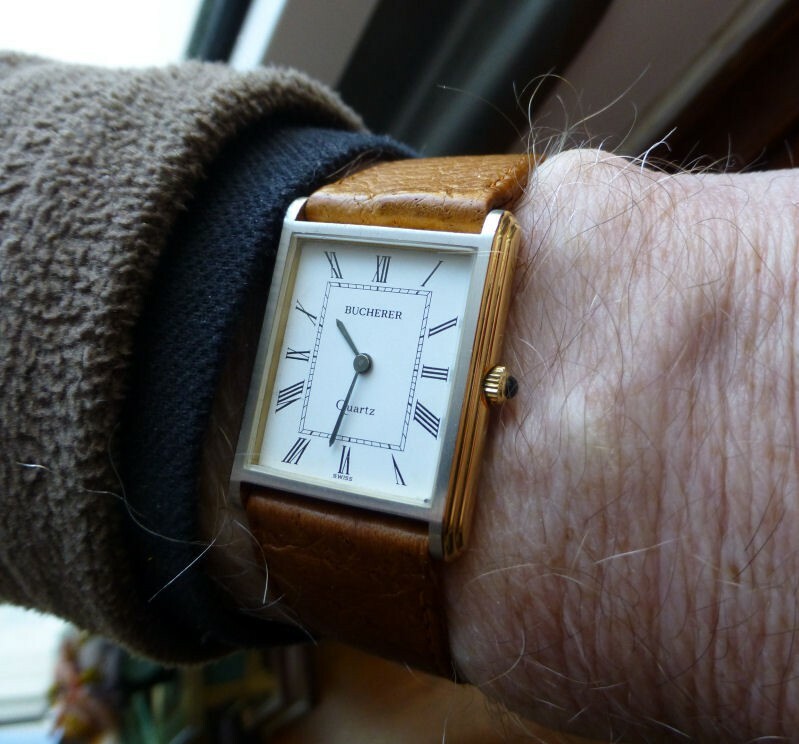 Latest News – Well I suppose it had to happen – this not being my usual style of watch – I sold it on Ebay to make way for new things. . . . quite sorry to see it go! 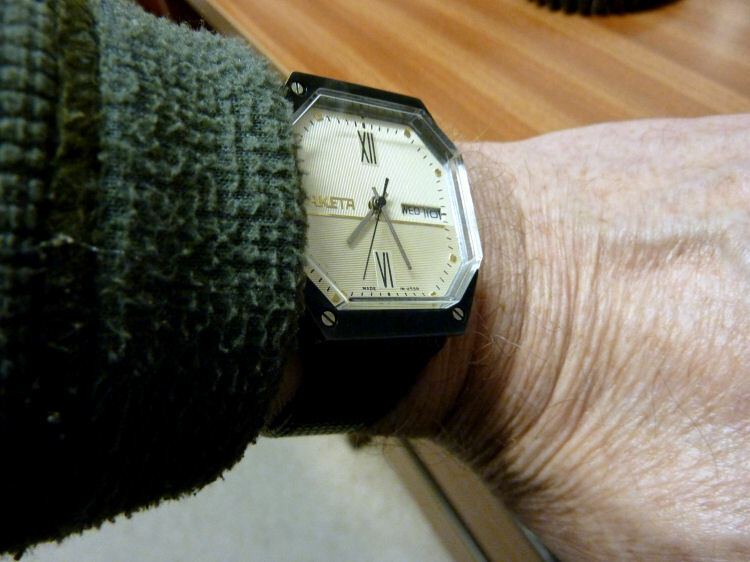 A wonderful and stylized made in USSR Raketa from the 1980’s. Russian watches from the old Soviet block were very much underrated. This model Raketa has a nice clear day and date feature the latter of which is easily adjusted by pulling out the crown to a second position – each pull changes the date by one. The day however has to be altered by moving the hands. It also has a shock proof balance and dust protection case. Note I changed the original bracelet as it was one of those typical inflexible steel strap affairs that firstly are very difficult to put on (they are so stiff) and the infinite clamp adjuster arrangement is so hard to manage. It is also one of the most uncomfortable straps you will ever find. So a simple black quality leather strap was fitted which actually compliments the watch style quite nicely matching the black colored top casing surface. 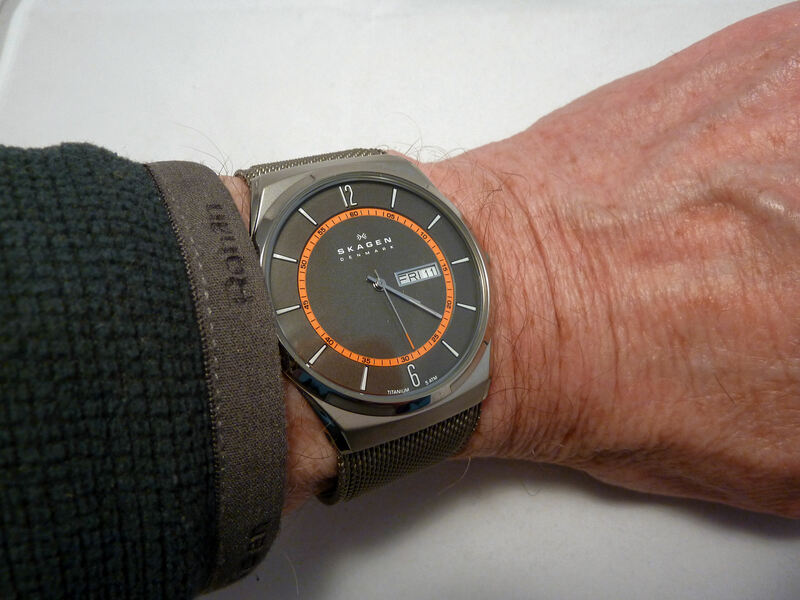 I usually get a few looks with this watch as it is certainly unusual – better still it keeps remarkably good time and it for some reason manages to get a fair bit of wrist time – always a good sign. . . . . .
That Obaku “Harmony” that’s what! Still one of my favorites in my modern watch section of my collection. Lovely watch to wear, very comfortable and I love the way you see the tips of the hands move rather than the whole hands. 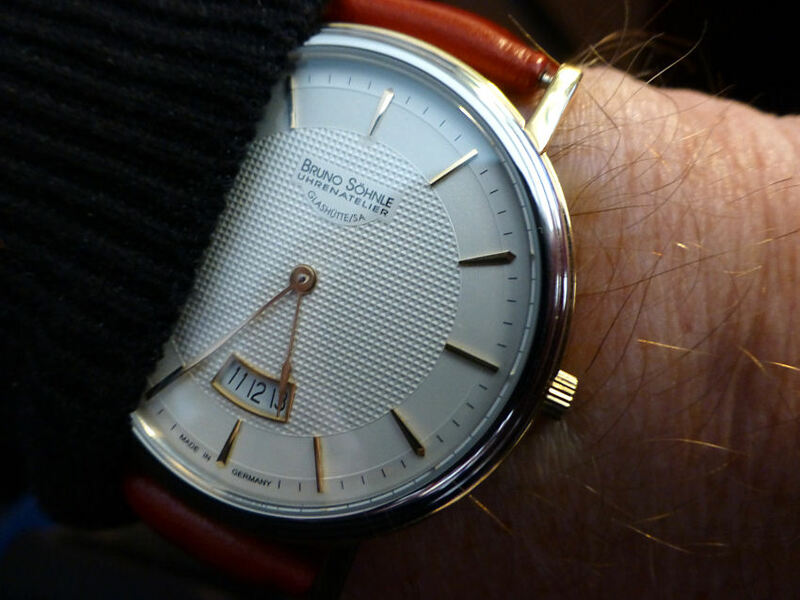 Especially the center seconds hand – a bit like the old “mystery dial” watches of the vintage era. I note that this model is now probably been updated which is a shame as I prefer it to the latest versions. One now has a small seconds and single color hands and the other similar and both with modified dials which I don’t find as nice. I like this version just fine. It needed a new battery and to take it to my local watchmaker the other day so he use his machine on it to get the back off, which is a very tight fit. 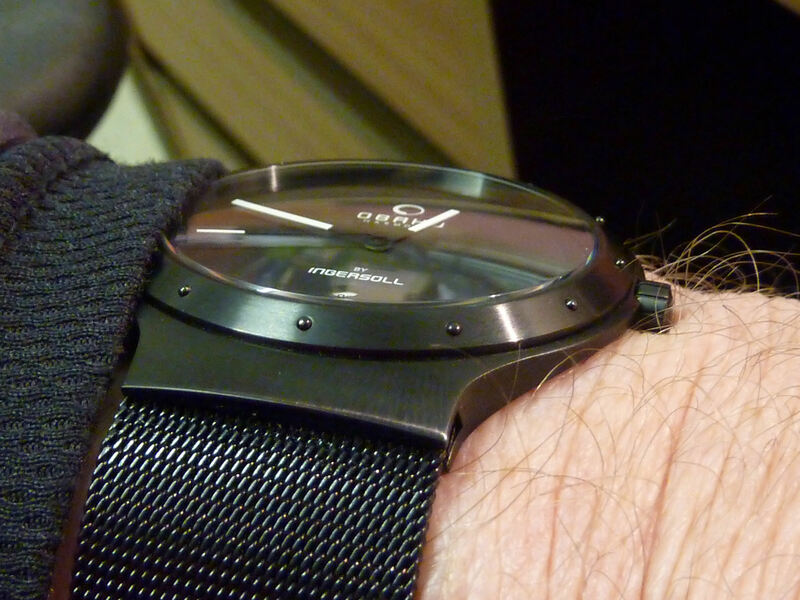 He is a fan of Skagen watches and admits he’d never seen Ingersoll Obaku models before, but was very impressed. By the way since wearing this watch I’ve discovered that the mesh strap is superb – smooth and very, very comfortable and in fact the best mesh I’ve ever worn! I’m glad I got this one when I did – one of my better purchases and at a great price. Current models are around £75.00 here in the UK. Latest News – Another casualty of the watch collector – sold it on to make way for new things and a little sorry to see it go – it was a pleasure knowing it. . . . This week it’s a nice Swiss Trebex – a lovely and stylish 17 jewel Cal. AS1351 Schild movement which is running sweetly. 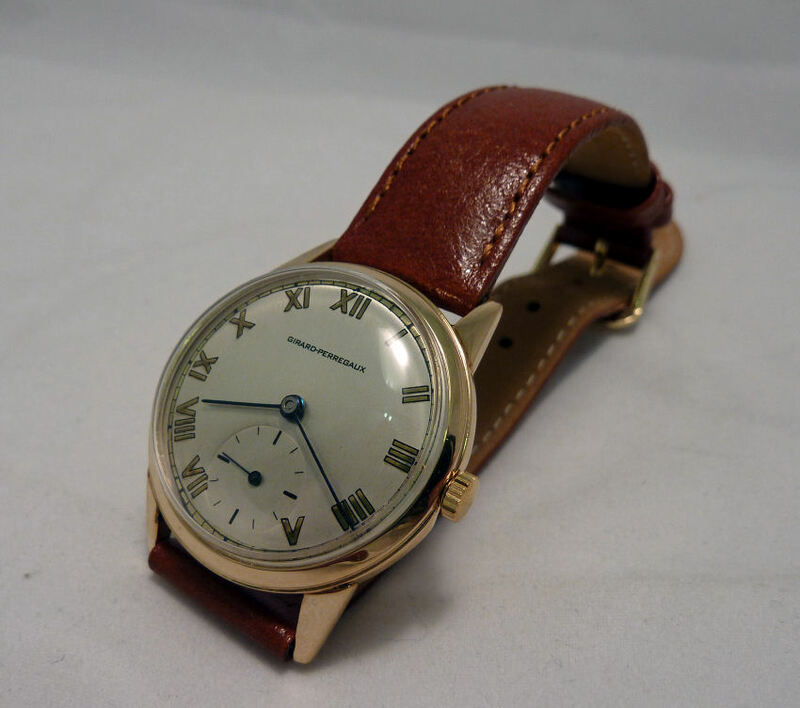 A lovely period vintage watch from 1948 and with a superb condition 9ct gold case. At 34.5mm diameter quite perfect for today. Very unusual original hands with the nice green luminous infill complete though no longer active of course. Wonderful fluted lugs and a superb green leather strap give makes this watch rather elegant. Tourbillon! and a personal one at that! This is a manual wind Tourbillon movement with 50+ hours power reserve in a homage styled design dial arrangement that looks pretty good. The case is in rose gold plated 316 stainless steel with a scratch-proof sapphire crystal plus exhibition case back and features 20m water resistance. Of course the name does say it all and for me undoubtedly gives a certain amount of egocentric pleasure which is heightened considerably when folks look at it and say. The tourbillon movement of course is a fascination in itself and I’m quite often asked what they are and why are they so expensive. Well basically it is a device to counter the affects of gravity on the moving parts of a watch movement. Originally as a pocket watch enhancement and as these were invariably worn in one particular position in the pocket or waistcoat gravitational factors did indeed affect the accuracy of the watch. It was invented as far back as 1795 by Abraham Louis Breuget a great French watch engineer and designer. He noticed that gravity had the most noticeable effect on the escapement and the balance which rocks back and forth. So he engineered a system to physically rotate the whole balance wheel of the movement through a complete 360 degrees which neatly counteracted the effects of gravity on any one particular point. Seeing the balance itself running around a little window in the dial and making a complete revolution every 60 seconds is in itself really quite fun to watch – even addictive! Of course such a movement is actually not needed today with the wristwatch being worn on the wrist physically moves it though countless positions every second of the day, so gravitational effects are pretty much evened out. Today it is purchased for the simple pleasure of owning such a wonderful and intricate piece of miniature engineering and of course the delight in being able to actually see it working. And are they expensive? – well yes they certainly can be very expensive as the amount of watchmaking skill required to make such a piece of work is awesome. This particular one however is not vastly expensive and in fact not even sourced from a Swiss maker (if it were the price would be many, many thousands) but from the other side of the globe. There are a few makers of tourbillons in the Far East and of these the Seagull movement is perhaps the most well known. 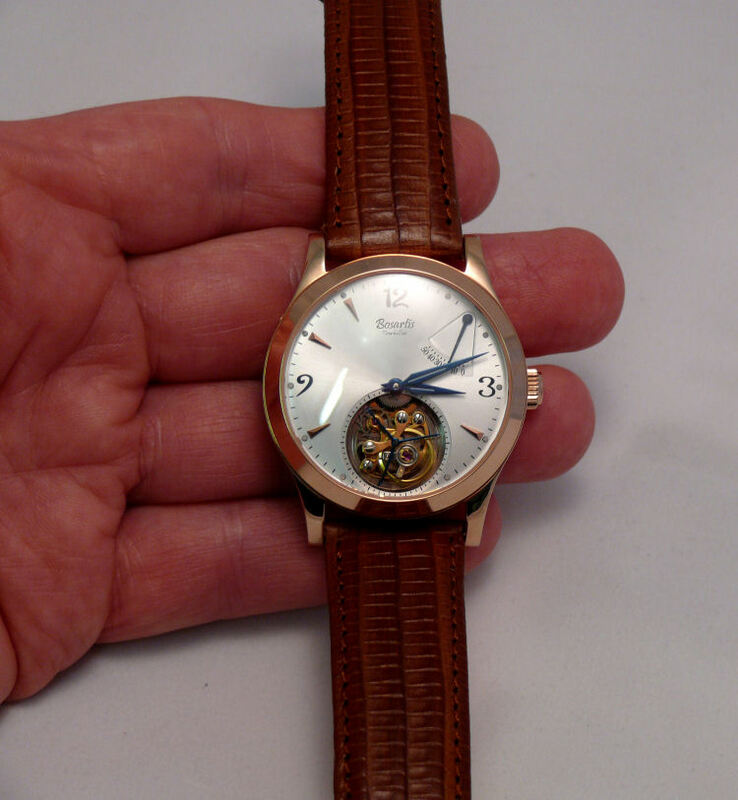 This one however is the Chinese Liaoning Flying tourbillon hand winding version and can boast considerable quality. Both are often found in private label designs and most interestingly some are actually used as the ebauche movements for some German AND would you believe Swiss mainstream manufacturers! Now is that some accolade or what! . . . . . wow! However I digress – So I got the basic watch – had my little private name added discreetly and here it is . . . . . . . . Neat! So for this week at least . . . . I’m in a whirl ( fr. tourbillon = whirlwind ). A Made in England watch! – Now there’s something you don’t see every day……a Swiss adjusted jeweled movement though – Well since the old Smiths vintage a UK mechanical movement is a bit thin on the ground! OR is it? 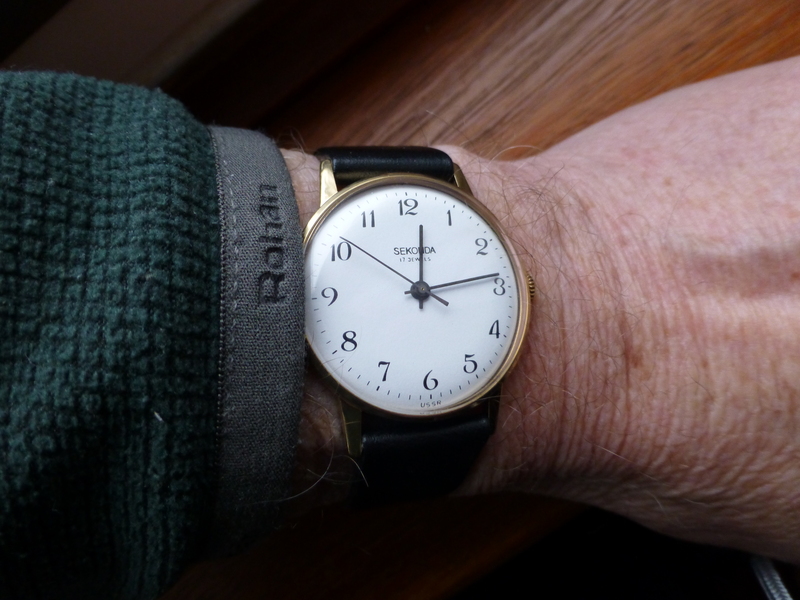 Check out my 14th August post – and my Smiths Astral – a true “Made in England” vintage watch. 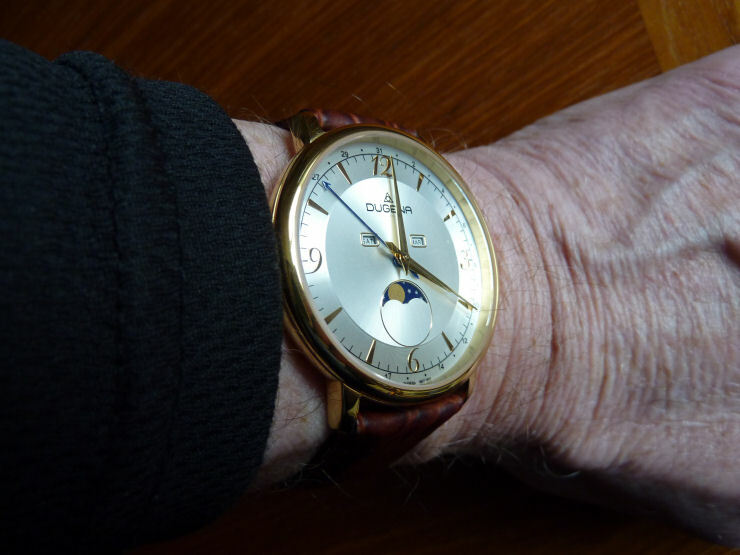 A dress watch this week – a nice Swiss German Dugena gold – Month & Day windows plus a date pointer and moon-phase – complicated but VERY nice! Well what can you say about a classic? An old favourite this time – my Breitling Aerospace 1999 model. Love everything about this watch. 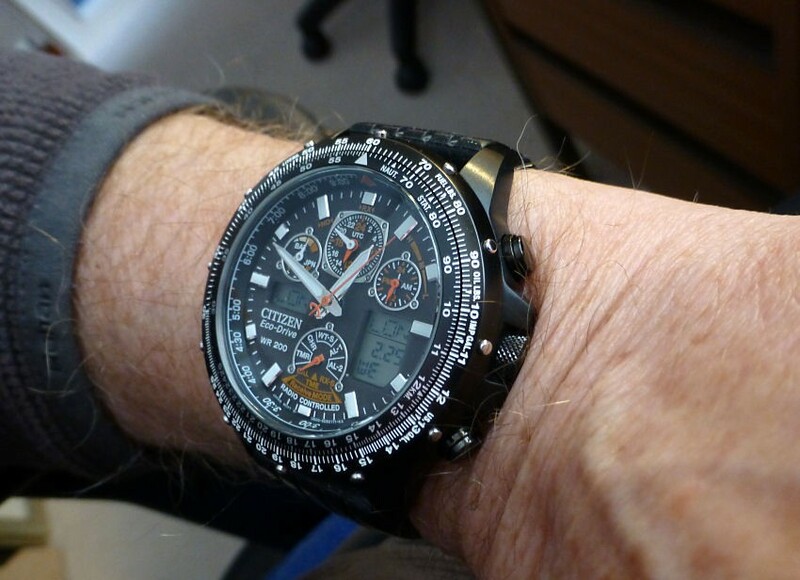 Many folks think the Breitling is big flashy and cumbersome, but this blows that image away. It’s titanium, it’s very light and slim at 9mm height and 42mm diameter and with matching titanium solid link bracelet it’s quite a combination. Slips unobtrusively under a shirt for dress occasions but also is the business when it comes to day wear – AND it’s a statement too. 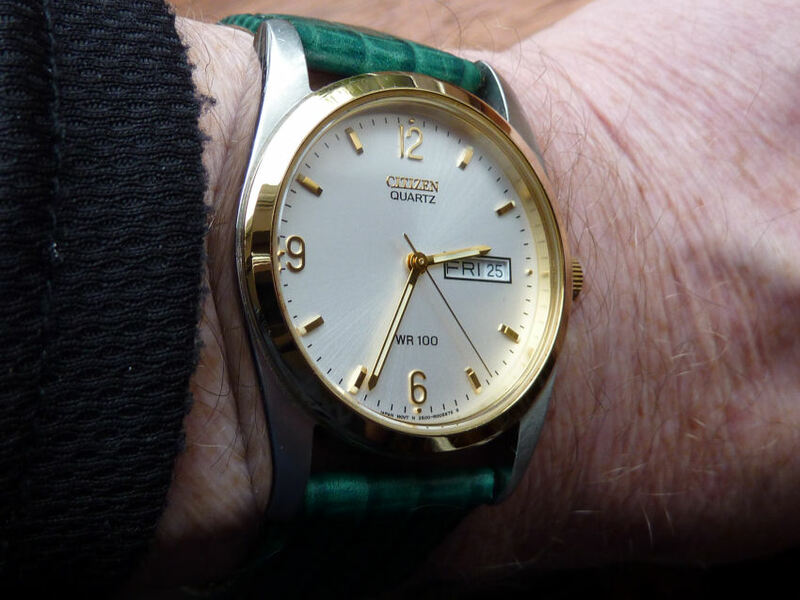 Always loved this subtle dial colour and if you decided to put it into Nato strap garb, then khaki green is perfect. But this is a super smooth bracelet (with wrist extension) and I’ve never felt the need to change. Clarity is all with this watch – the date is the clearest to read of any watch I know – anti-reflection coated flat sapphire crystal – and slim hands with the so so clever extended over centre minute hand – plus a nigh on perfect and unstated lume at night – it’s about as good as it gets. Next week? Not sure at the moment – check back Sunday ‘cos I’ll be wearing whatever it is! 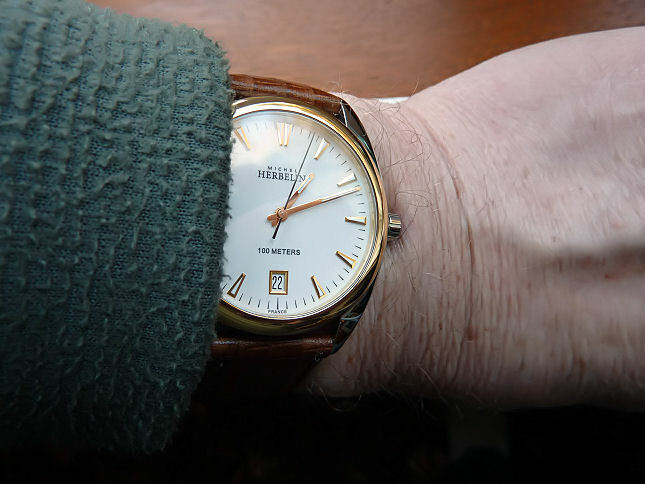 Well this one’s made in France – a superb quality Michel Herbelin gold Ambassador model 2-tone dress watch. Wonderful porcelain-white dial with gold markers and gold hour and minute hands (each with white luminous infil), black centre seconds and a date window @6. The polished gold bezel contrasts nicely with the very highly polished stainless steel case. A very stylish watch indeed. 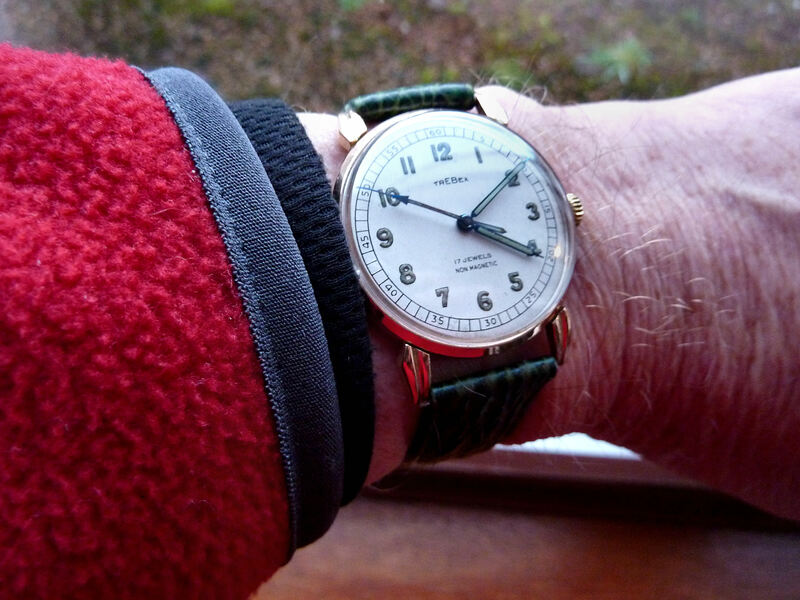 Originally came with a two-tone matching bracelet, but I found it wasn’t getting wrist time – but since I changed to a superb Teju lizard strap – I wear it frequently. One thing I have found with watches made in France – almost always they are of very high quality manufacture – use high end Swiss quartz movements – and this one is no exception – it is a delight. Many thanks for your comment – appreciated. Noted your excellent web site with pre-owned watches and useful data – I have added a link to it.